Jerry Daniel’s primary practice areas are Elder Law, Wills and Estates, Corporate Law, Homeowners Associations concerns, and Family Law. He holds a Bachelor’s Degree from the United States Air Force Academy, a Masters Degree in Public Administration from Troy State University, and a Juris Doctorate from the Thomas Goode Jones School of Law. Mr. Daniel is a member of the Elder Law Section of the Alabama State Bar, and is admitted to practice before the Alabama Supreme Court, the United States District Court for the Middle District of Alabama, and the United States Bankruptcy Court for the Middle District of Alabama. Mr. Daniel is retired from the United States Air Force where he served as a navigator aboard weather reconnaissance and combat aircraft. Mr. Daniel is married to Dawn Daniel, who is also retired from the Air Force, and is glad to call Millbrook home. 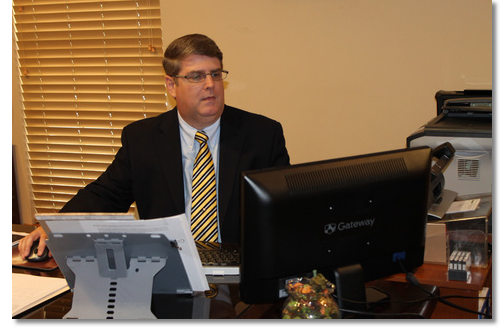 His primary location is in the Millbrook office; however, he likewise offers services in the firm’s Foley, Alabama office. Mr. Daniel currently holds the office of president of the Board of Directors of the Millbrook Area Chamber of Commerce.